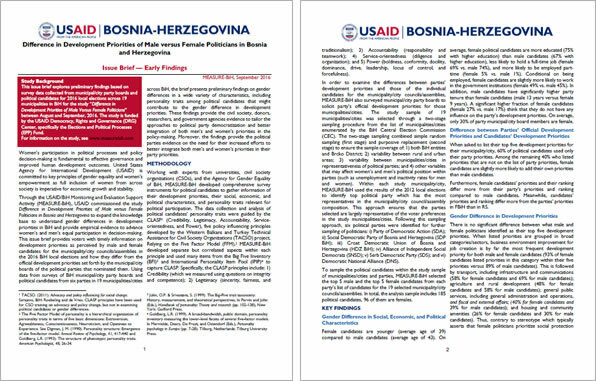 Difference in Development Priorities of Male versus Female Politicians and Voters in Bosnia and Herzegovina is a study funded by the USAID Democracy, Rights and Governance (DRG) Center, specifically the Elections and Political Processes (EPP) Fund. 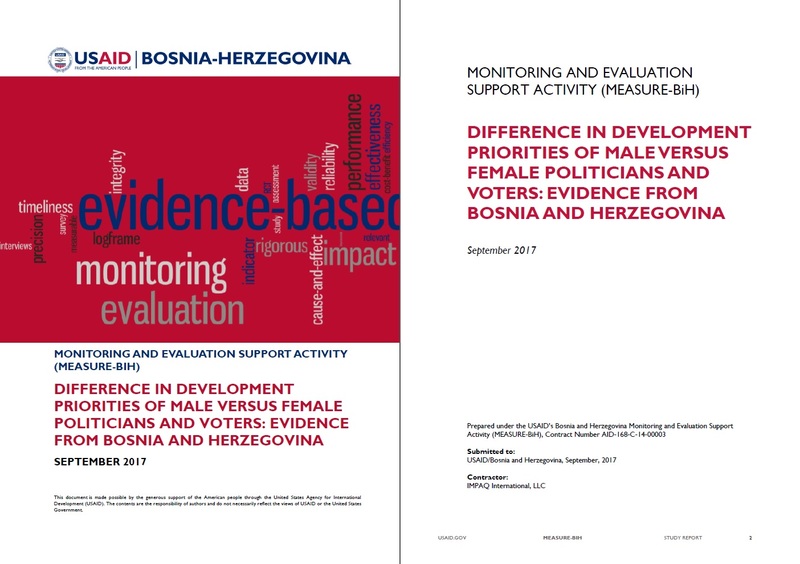 It was conducted by MEASURE-BiH in two phases between Spring 2016 and Summer 2017 to expand the knowledge base to understand gender differences in development priorities in BiH and provide empirical evidence to advance women's and men’s equal participation in decision-making. Indications of gender gap in politicians’ influence over development priorities within parties. Are there gender differences in local development priorities among politicians? Are there gender differences in the match between politicians’ and their parties’ local development priorities? Are there personality trait differences between male and female politicians? Are there differences between priorities of politicians and priorities of citizens? Are there gender differences in citizens’ development priorities? Are there personality trait differences between politicians and citizens? Are there personality trait differences between male and female citizens? Does political gender stereotyping affect citizens' voting decitions? The fist phase of the Study included surveys of municipal/city political party boards and 185 political candidates for municipality/city councils/ from six political parties in 19 municipalities/cities across both entities. The second phase of the Study included survey of 1.985 voting-age citizens in the same 19 municipalities/cities. The Study provides the civil society, donors, researchers, and government agencies with the evidence to tailor the approaches to political party democratization and better integration of both men’s and women’s priorities in the policy-making. In addition, the study also provides the political parties evidence on the need for their increased efforts to better integrate both men’s and women’s priorities in their party priorities. Finally, evidence on voter preferences and gender stereotypes are given, as well as data on personality traits for both political candidates and citizens.